The area of Karachi in Sindh, Pakistan has a natural harbor and has been used as fishing port by local fisherman belonging to Sindhi and Baloch tribes since prehistory. The port was known to the ancient ancient Greeks by many names: Krokola, where Great camped in Sindh to prepare a fleet for Babylonia after his campaign in the Indus valley; 'Morontobara' port (probably the modern Manora Island near the Karachi harbor), from where Alexander's admiral Nearchus sailed for back home; and Barbarikon, a sea port of the Indo-Greek Bactrian kingdom. Karachi was called Ramya in some Greek texts. The Arabs knew it as the port of Debal, from where Muhammad Bin Qasim led his conquering force into Sindh (the western corner of South Asia) in AD 712. According to the British historian Eliot, parts of district of Karachi and the island of Manora constituted the city of Debal. 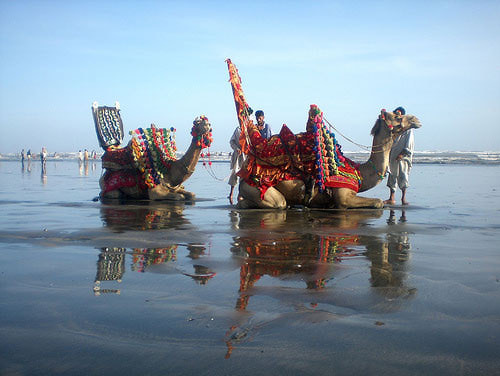 Lahari Bandar or Lari Bandar succeeded Debal as a major port of the Indus it was located close to Bhambore, in modern Karachi. According to legend, the city started as a fishing settlement, where a fisherwoman, Mai Kolachi, settled and started a family. The village that grew out of this settlement was known as Kolachi-jo-Goth (The Village of Kolachi in Sindhi). When Sindh started trading across the sea with Muscat and the Persian Gulf in the late 18th century, Karachi gained in importance; a small fort was constructed for its protection with a few cannons imported from Muscat.